Answer: As, Outlook stores all the mails and other email components in a .pst file, gradually the size of the .pst file grows. In general, the PST file has a maximum permissible size limit. In MS Outlook 2002 and previous versions, the maximum suggested PST size limit is 2 GB. In case of Outlook 2007 and 2003, the size limit is 20 GB, whereas in 2010, it can be increased up to 50 GB. However, at times, the size of PST file grows even 50 GB, leading to corruption of the PST file and inaccessibility of the mails in it. Moreover, with a large Outlook PST file, normal operations like sending/opening/archiving mails become slow. In order to avoid all such situations, you need to split your large Outlook .pst file into usable multiple .pst files using Stellar Splitter for Outlook. How to split a single and multiple Outlook .pst file? Answer: Stellar Splitter for Outlook provides two different options to split either a single .pst file or multiple .pst files in a single operation. Run Stellar Splitter for Outlook and click the icon 'Split Single File' on the main interface. A new Window opens. If you know the exact location of the .pst file, then select it from the location. If you don't know the exact location of the .pst file, click 'Find PST File', which will list all .pst files in the system. Choose the .pst file from the list and click 'Split PST File'. A new window opens with different splitting options. Select the required splitting option and provide information in the section, 'Option Description'. Click 'Next' button to start the splitting process. Run Stellar Splitter for Outlook and click the icon 'Split Multiple Files'. A new window opens, with two major splitting options. Click either 'Split By Time' or 'Split By Size', depending upon your requirement. Another window opens. If you want to split files from a single folder, click 'Select Folder'. If you want to split files from different locations, click 'Select Files'. If you have created a batch file, you can click 'Select Batch File' button to select the file from its location. Select the file and click 'Split PST File' button. Depending upon the option, you have chose, select the files and customize the split options. Click 'Next' to start splitting. What are the different alternatives available to split the .pst file? Using Stellar Splitter for Outlook software, you can split a single .pst file or multiple .pst files in a single operation. The 'Split Single File' option of the software provides 4 different criteria ('Split By Date', 'Split By Size', 'Split By Mail ID' and 'Select & Split') for selecting a large .pst file and split it to a smaller one. The 'Split Multiple Files' option of the software provides 2 different criteria ('Split By Time' and 'Split By Size') for selecting multiple .pst files and split them into smaller usable .pst files. In both the options, you just need to select the .pst file and choose the criterion for splitting. The user manual of the software describes the splitting processes in detail. How to find the location of the .pst file on my computer using the software? Answer: From the main interface of the software, select the option, 'Split Single File'. A new window opens, in which there is an option 'Find PST File'. Click 'Find PST File' button to list all the .pst files in your computer with their locations. You can choose the required .pst file from the list and split with the appropriate split criterion. How Stellar Splitter for Outlook software helps in improving Outlook performance? Answer: When the Outlook PST file grows bigger in size, normal email operations like opening/ copying/sending/archiving an email or editing of notes, calendars etc. become remarkably slow. 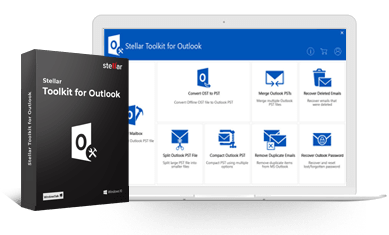 Stellar Splitter for Outlook software helps in splitting large PST files into multiple smaller PST files, which makes Outlook to perform better.